Strontium is an alkaline earth metal mainly used to prevent X-ray emission in cathode ray tubes. It is also used in specialty alloys. Domestic Production and Use: The United States is 100% import reliant on celestite, the most common strontium mineral, which is imported exclusively from Mexico. U.S. production of strontium minerals ceased in 1959. Domestic production of strontium carbonate, the principal strontium compound produced globally, ceased in 2006. A few domestic companies produce small amounts of downstream strontium chemicals. Estimates of primary strontium compound end uses in the United States were pyrotechnics and signals, 30%; ferrite ceramic magnets, 30%; master alloys, 10%; pigments and fillers, 10%; electrolytic production of zinc, 10%; and other applications, 10%. 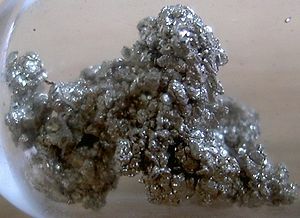 Import Sources (2005-08): Strontium minerals: Mexico, 100%. Strontium compounds: Mexico, 80%; Germany, 12%; and other, 8%. Total imports: Mexico, 91%; Germany, 5%; and other, 4%. Events, Trends, and Issues: Consumption of strontium minerals has dramatically declined from its peak in 1997 as a direct consequence of increased demand for liquid-crystal displays, which require little or no strontium carbonate, as an alternative to cathode-ray tubes (CRTs) for televisions. Estimated strontium consumption in ceramics and glass manufacture remained one of the top end-use industries through its use in ceramic ferrite magnets and other ceramic and glass applications. The use of strontium nitrate in pyrotechnics was estimated to equal the use of strontium carbonate in ferrite magnets; however, the strontium consumption in pyrotechnics is likely to decline as nitrogen-base oxidizers are substituted for carbon-based oxidizers to minimize the smoke emitted while deploying pyrotechnic products, which will require less strontium nitrate to achieve the same color intensities. In descending order of production, China, Spain, and Mexico are the world’s leading producers of celestite; however, decreases in production in Mexico and Spain are expected in the near term. China is becoming more reliant on imported celestite because Chinese celestite reserves are smaller and of lower quality than those in other major producing countries. The Iranian celestite industry was expecting strong growth over the next 3 years owing to increased exports to China, coupled with the low cost of container freights and with government subsidies. With new suppliers to China and decreased demand for CRTs, Spanish production of celestite is expected to decrease, as a key celestite mine and refinery closed at the beginning of 2010. Turkey, which had been a leading celestite producer, ceased production. World Resources: World resources of strontium are thought to exceed 1 billion tons. Substitutes: Barium can be substituted for strontium in ferrite ceramic magnets; however, the resulting barium composite will have a reduced maximum operating temperature when compared with that of strontium composites. Substituting for strontium in pyrotechnics is hindered because of the difficulty in obtaining the desired brilliance and visibility imparted by strontium and its compounds. Dazu Hongdie Strontium - Joint venture between Chori and Qingdao Red Star Group produced RMB 400M worth of strontium in 2007.